Manipur Governor Najma Heptulla and Chief Minister N Biren Singh led the people in paying homage and offering floral tributes to the former Prime Minister Atal Bihari Vajpayee in a public prayer meeting organised in his honour in Imphal. Speaking on the occasion, Governor Dr Najma Heptulla said that paying tribute to the former Prime Minister would be meaningful only when people follow his path. Recalling her long association with the former Prime Minister especially when she was the Deputy Chairperson of parliament, she said that she is hoping to write her memoir on how the democracy worked when a Deputy Chairman and an Opposition leader belonging to different political backgrounds shared views on the matters relating to the nation. Terming Vajpayee as a true human being and a true Indian,she added that Vajpayee believed in his commitments, and he would be ever remembered for his works towards the service of the nation. In his speech, Chief Minister N Biren remembered Vajpayee as a warm-hearted leader and a Parliamentarian, who never differentiated people on the basis of caste, creed, rich or poor and opposition or ruling parties. N Biren, who visited the national capital to attend the cremation of the former Prime Minister last week, informed the day’s gathering that he also participated in the procession which covered around 6 km on foot from BJP headquarters to Smriti Sthal and taken part by Prime Minister Narendra Modi and hordes of senior leaders and politicians coming from different parts of the country along with thousands of people. N Biren said that a person’s greatness and contribution to the nation is visible more clearly only when he/she passes away. “In his demise, the country has lost a great leader,” the CM lamented. 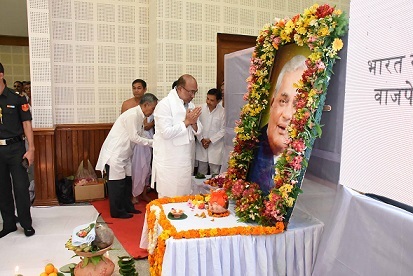 State Assembly Speaker Y Khemchand, Cabinet Ministers, MLAs, senior politicians, high ranking civil and police officers and a large number of people also attended the prayer meeting and paid floral tribute to the photograph of Vajpayee. Later, ashes of the former Prime Minister were immersed in Imphal River by the Chief Minister. Earlier the urn containing ashes of the former Prime Minister arrived at Imphal Airport from Delhi at around12.30 pm.From there, a procession was taken out up to BJP Manipur Pradesh office located at Keishampat to pay floral tributes to the Bharat Ratna awardee.